In the highly competitive OTT market agility as well as speed of decision and execution are alongside quality of content and user experience a key success factor. The choice of governance is correspondingly important. Airbus is often mentioned as an example of a successful pan European venture. It has clearly revolutionized the aviation and did put Europe back on the map of a US dominated industry. Looking under the hood reveals the complexity of multi share holder joint ventures. During many years the necessity to maintain a layered management structure within EADS/Airbus (one French, one German, one French) and the permanent negotiations between the shareholders to maximize their ROI has had significant impacts on the productivity of the company and complexified decision making. Over the years I have worked with almost all the broadcasters mentioned in my articles. Creating an entity regrouping private and/or public broadcasters that have they been competing over decades, have very different corporate cultures, funding models and operate in different legal frameworks is a real managerial challenge. Doing it at multinational level does not make it any easier. Once the partners have developed a shared a longer-term vision and objectives for this joint service they need to agree on a simple governance model. Creating a dedicated independent entity with its own governance, processes and target metrics feels like the best way to go provided it is not made of the combination of the one of all the stakeholders. Let’s hope that they will be inspired German’s unique sense of compromise and pragmatism. For the service to prevail they might have to give up their own or at least find the proper seamless integration and articulation between the two. The will need to resist the temptation to create multiple small alliances that individually will always miss the necessary scale and resources to become appealing eco systems for the viewers and really compete. Even in countries like Germany with limited pay TV acceptance the trend shows an increasing level of acceptance for the simplicity of subscription-based models as opposed to transaction-based ones even if especially in its EST form it gives access just a few weeks after theatrical releases to premium movies. In parallel the consumer acceptance of multi subscription opens some business space. Targeting the typical consumption mix of the US S-VOD services (60% series, 20% documentary, 20% movies) will not work. The quality and the differentiation would be insufficient. A Freemium model combining linear, catch up and VOD in its different flavours (Free VOD, A-VOD, S-VOD and T-VOD) and including Sports even if challenging from a UX and rights management perspective would offer a real value add for consumers resulting in improved acceptance and consumption. This would also sort out the search and recommendation problematic one of the strongest current issues that generates viewer frustration and results in higher churns. It will also finally enable the creation of recommendation driven personalized linear channels combining linear and VOD assets that will appeal especially to the older demographics. 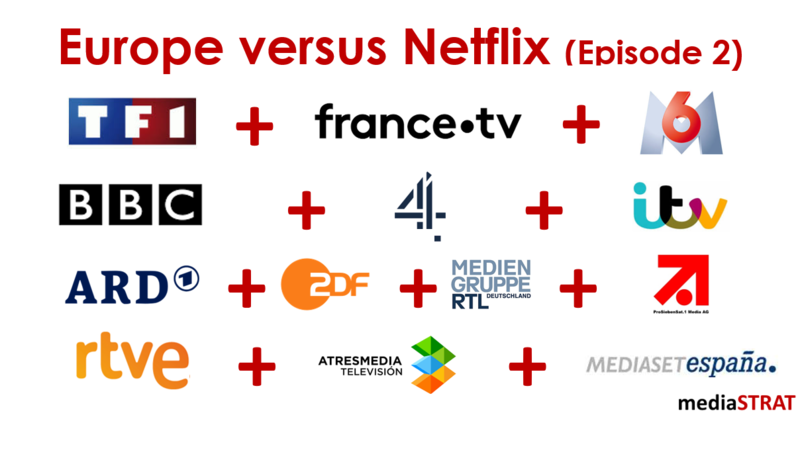 Europe has definitively lost the opportunity to create champion(s) at early stage of the paradigm shift in media consumption, but it is now time to really go ahead and propose innovative services. As mentioned in my recent FKTG conference in Nurnberg about technical investments in the time of TV4.0 Era and business model changes: Every media organization starts to feel the pain, but margins are still strong and investment resources available. Individual media organizations will struggle to fund their legacy businesses that will still make up most of their revenue and profit for the years to come while investing in new distribution forms and appropriate content. Mutualization offers a path. Delaying it any further will lead to progressively weaken the position of the individual media groups as they lose subscribers and ad revenue while their audience age and public funding diminishes. Cooperations will become more and more defensive moves among struggling partners opening up always more space for international competition with a globalized offering. European countries and Europe itself would lose its voice and particularity. Now that the editorial, governance and business framework is defined one needs to go ahead with the operational and technological homework that I will cover in the upcoming Episode 3.
next post: The future of Hulu?